Caos Linux NSA was a light-weight, fast, efficient, stable, and secure distribution of Linux that was appropriate for servers, compute nodes, network appliances, and even the latest desktop and laptop computers. It was maintained and managed by a team of computer science experts with numerous proven skills. With resources pooled together, they created a multifunctional operating system with mission critical dependability. Caos Linux was designed to run on all x86_64 and i386 hardware ranging from clusters and servers to production level appliances to personal desktops and laptops. Supporting a wide variety of software, Caos Linux was based on the best aspects of GNU/Linux and has full binary compatibility with the most popular enterprise distribution of Linux. Rate this project Justin Sherrill has announced the release of DragonFly BSD 3.4.1, a UNIX-like operating system created in 2003 as a fork of FreeBSD 4.8: "Version 3.4 of DragonFly BSD is officially out." Big ticket items of the release include: "Experimental packaging system - dports uses the FreeBSD ports system to build ports for DragonFly and uses pkgng to manage the binary packages produced from those ports; The DragonFly snapshots are built using dports and also have Xfce for the desktop; performance improvements under extreme load - improvements in poudriere performance, tmpfs performance and CPU usage; new default compiler - the two base compilers have swapped roles, GCC 4.7, introduced as an alternative compiler with release 3.2, is now the primary compiler used to build DragonFly; new USB stack - USB4BSD." See the brief release announcement and read the detailed release notes for a full list of new features and improvements. Download (MD5): dfly-x86_64-3.4.1_REL.iso.bz2 (221MB), dfly-x86_64-gui-3.4.1_REL.iso.bz2 (991MB). 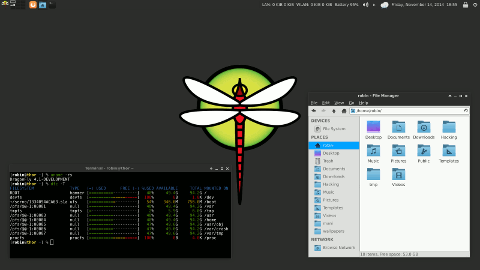 The DragonFly BSD project has announced a new version of their operating system. The new version, DragonFly BSD 5.4.0,includes a number of performance improvements, ships with version 8.0 of the GNU Compiler Collection, and HAMMER2 file system bug fixes. "Big-ticket items: Better support for asymmetric NUMA (Non-Uniform Memory Access) configurations. In particular, both the memory subsystem and the scheduler now understand the Threadripper 2990WX's architecture. The scheduler will prioritize CPU nodes with direct-attached memory and the memory subsystem will normalize memory queues for CPU nodes without direct-attached memory (which improves cache locality on those CPUs). Incremental performance work. DragonFly as a whole is very SMP friendly. The type of performance work we are doing now mostly revolves around improving fairness for shared-vs-exclusive lock clashes, reducing cache ping-ponging due to non-contending SMP locks (i.e. massive use of shared locks on shared resources), and so forth. Major updates to dports brings us to within a week or two of FreeBSD's ports as of this writing, in particular major updates to chromium, and making the whole mess work with gcc-8. DragonFly now ships with GCC 8.0, and runs as the default compiler. It is also now used for building dports." Further information can be found in the release announcement. Download: dfly-x86_64-5.4.0_REL.iso (989MB, MD5, pkglist).